Emily St. John Mandel was born and raised on the west coast of British Columbia, Canada. 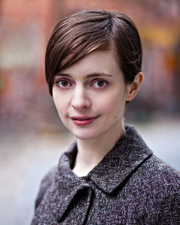 Her most recent novel, Station Eleven, was a 2014 National Book Award Finalist. She is also the author of three previous novels: Last Night in Montreal (2009), The Singer’s Gun (2010), and The Lola Quartet (2012). All four of her novels were Indie Next Picks, and The Singer's Gun was the 2014 winner of the Prix Mystère de la Critique in France. Her short fiction and essays have been anthologized in numerous collections, including Best American Mystery Stories 2013. She is a staff writer for The Millions. She lives in New York City with her husband.